January: Expansion of EU to 27 Member States. December: Nutrition Claims Regulation finally published - but it is the wrong version which appears in the Official Journal! 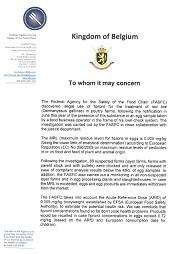 January: Regulation 178/2002 becomes fully effective and introduces new food law requirements. February: Extraordinary meeting of the Codex Alimentarius Commission held in Geneva to discuss proposals in the Evaluation Report. January: Following the discovery of 10 cases of BSE in Germany, both the Health Minister and the Agriculture Minister resign. Other cases have been found in Belgium and France. September: Commission establishes a Food and Veterinary Office based in Dublin. May: Foodlaw-Reading web site opens. March: Government statement that BSE in cattle is the most likely cause of nvCJD in people. Exports of beef banned. September: New Hygiene Regulations (SI 1995 No 1763) enter into force. These implement the requirements of the EU Hygiene Directive and introduce a requirement for food business to identify critical points - a step towards the HACCP system. January: The World Trade Organisation (WTO) is formed and the Sanitary and Phytosanitary Agreement comes into effect. June: EU adopts Directives on sweeteners (94/35/EC) and on colours (94/36/EC). May: With rising numbers of cattle being infected with BSE, the Minister of Agriculture seeks to reassure the public by eating beefburgers in public with his daughter. February: Continuing food scares hit the headlines - Listeria is new concern. December: Edwina Currie, a Junior Health Minister resigns following her statement suggesting that most eggs are infected with Salmonella.